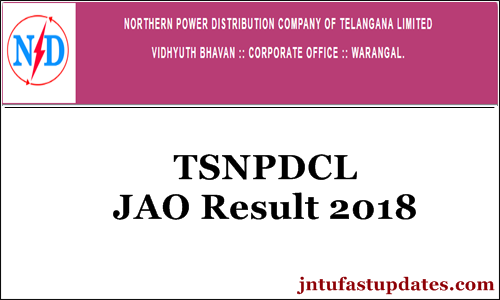 TSNPDCL JAO 2018 Results, Cutoff Marks & Score Card Download: Telangana State Northern Power Distribution Company Limited (TSNPDCL) has conducted the Junior Accounts Officer examination in many places of the state. Competitors applied for JAO posts have hugely appeared for this exam. As per the organization reveals almost 80% of applied aspirants have competed for the examination. The Northern Power Distribution Company, Telangana has conducted the test with proper care and arrangements. It also made accessible of the answer keys after the examination. The competitors have cross-checked with the answer keys and estimated the score by comparing the official answer sheet. TSNPDCL is anticipated to announce the results, cutoff of the JAO examination soon on its official website, tsnpdcl.in. aspirants can check the TSNPDCL JAO result, Cutoff marks shortly. The organization will soon announce the result date; stay checking the TSNPDCL website on a frequent basis for more details. Telangana State Northern Power Distribution Company Limited (TSNPDCL) is the state level power transmission department of the northern wing. The organization works for the enhancement of Power related operations in the state. It annually issues various recruitment notifications for the aspirants seeking state government jobs. This year the TSNPDCL has released the notification for 107 Junior Accounts Officer (JAO) posts. A huge number of the aspirants seeking Telangana state government jobs have applied for the announced posts. The TSNPDCL selects the candidates on the basis of their merit in written test and interview rounds. Candidates applied for the TSNPDCL JAO posts have attended the written test round on 22nd July (from 10.30 am to 12.30 pm) in many examination centers across the state. Thousands of hopefuls have competed for the TSNPDCL examination to get the JAO jobs this year. Based on the merit of aspirants, the screening will be done by the authority. The cutoff marks/qualifying marks of the conducted examination will also be announced by the organization. To clear the written test round, candidates need to score the minimum qualifying marks in the test. The TSNPDCL JAO Cutoff marks will be accessible category-wise, section-wise, and overall. Candidates have to get the satisfying marks in all scenarios to clear the written test phase. The TSNPDCL Junior Accounts Officer Result link will appear on the homepage. (at the time of result declaration). Click on the link and enter the required info such as register number, password, DOB etc. Ensure you have entered the correct details and click on submit tab beneath it. The result and cutoff marks of TSNPDCL JAO examination will appear on the screen. Check the result and take a printout for future proceeding. Where you heard from? Is it only your bhavana? It may not be truth. minimum oka 10 -15 member kalasi hanamkonda loni head office lo NPDCl CMD garini kalisi vishayam thelusukuni variki oka letter ichi next em cheyalo alochiddam. inrerest undi near by place lo unnavallu vasthe oka date lo kaluddam. Municipal jao notification vochinda friends? CaN PLaC WeBSiTE NaME ?? There are only 2 members who got 86 and rest of all are bellow 86 only don't try to spread rumours…. bro . there are more than 4 whatsApp group already. How long will wait for that …..??????? KARMA pays back. I pity you!! definitely bro Karma will pays back …if not now,but definitely ..god bless you my child !!!!!!!! chill chill my rowdy baby!